Using your rearview and side mirrors. Using your side mirror and looking over your shoulder. When entering any roadway, you must be aware of traffic conditions. Use your side mirror and look over your shoulder to help you see and anticipate traffic when entering a freeway. Walk completely around the vehicle to be sure no person or obstacle is behind it. Look to the front, sides, and rear. If you are going to back up a vehicle, it is a good practice to first walk around the vehicle to be sure no person or obstacle is behind it. Before backing, you should look to the front, sides, and rear and continue to look over your right shoulder to the rear while backing. Do not depend only on your mirrors. A road joins from the right. The road ahead turns sharply right then sharply left. Warning signs are usually yellow with black markings. 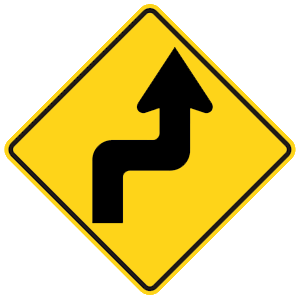 This sign indicates that the road ahead will turn sharply to the right and then sharply to the left. Road conditions can be affected by freezing temperatures, ice, snow, and fog. There are increased hours of darkness. Winter brings its own particular driving hazards. Fog, rain, snow, sleet, ice, and increased hours of darkness add to the dangers of driving. The smart driver prepares for these adverse conditions. If your vehicle enters a skid, you should take your foot off of the brake and steer in the direction that you want to go. For example, if the rear of your vehicle is skidding to the left, you should steer to the left. This will help bring the front of the vehicle in line with the rear, thereby straightening out the vehicle's overall direction. Closer behind the truck than you would if following a passenger vehicle. Farther behind the truck than you would if following a passenger vehicle. To the right side of the truck and wait to pass. It is necessary to follow farther behind a large truck than you would if following a passenger vehicle because trucks have larger blind spots.